We need help in a big way. About 2.5 years ago our then 4 year old son played the “claw machine” for the first time and won a stuffed animal that he named “Hippie”. Hippie looked like an orange hippo with purple spots and very similar to Beast from Maggie and the Ferocious Beast with different colors and minus the horns. 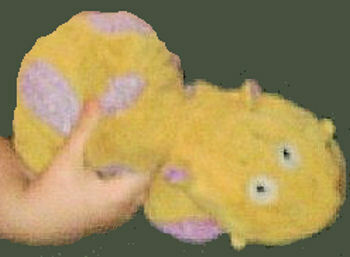 He was extremely soft and the purple spots were made from a fabric I think may be called curly fur. The soles of his feet (or hooves) as well as the inside of his ears and nostrils were also purple, but the fabric was the same as his body and head. His eyes were embroidered, and his mouth was an embroidered crooked smile. We don’t know the manufacturer, the tag wore off long ago, but suspect a company called Sugar Loaf. He carried that stuffed animal with him everywhere and slept with it every night. He pronounced Hippie a member of the family. Yesterday afternoon he left hippie on the porch while playing outside, and one of our dogs shredded him. We certainly would appreciate any help anyone can provide. Our son had so much trouble sleeping without his beloved Hippie! Just a few minutes ago he was crying this is the worst thing that has ever happened in his entire life! “Why my Hippie?” It’s heartbreaking. We all sincerely appreciate any help you may be able to provide. It drives me crazy, cause I saw this plush a couple weeks ago on ebay. I can’t find it, I will keep looking. It may have been listed as a hippo or dinosaur.